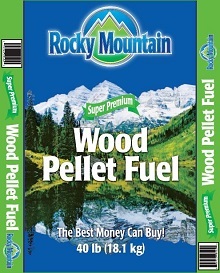 Confluence Energy produces three products for use in your home – Eco Flame wood pellets, Rocky Mountain super premium wood pellets and Platinum Fire super premium wood pellets. Wood pellet fuel burns cleaner than cord wood, emitting less than 15% of the particulates that a regular wood-fired furnace or stove would emit. Wood pellets are derived from a renewable energy source. Here in Colorado, we use trees killed by the mountain pine beetle, which is devastating Colorado’s forests. This material would otherwise be left on the forest floor to burn or decay. We are therefore carbon neutral, allowing you to heat your home or business without emitting carbon that would not otherwise be released. This is a local energy source. Pellet fuel is a renewable, clean-burning and cost stable home heating alternative currently used throughout North America. It is a biomass product made of renewable substances generally recycled wood waste. There are approximately 800,000 homes in the U.S. using wood pellets for heat, in freestanding stoves, fireplace inserts and even furnaces. Pellet fuel for heating can also be found in such large-scale environments as schools and prisons. North American pellets are produced in manufacturing facilities in Canada and the United States, and are available for purchase at fireplace dealers, nurseries, building supply stores, feed and garden supply stores and some discount merchandisers. To ascertain the value proposition of wood pellet fuel in the Intermountain region, Mountain Burkes obtained 3rd party laboratory tests results, along with home hearth testing and combined this information with a price survey to obtain a composite value. In testing, Confluence Energy out performed other premium wood pellets for heat output, low levels of fines, low moisture levels and overall satisfaction.